Is it possible for an AC current (current passing from CFL) to have a harmonic component greater in magnitude than its fundamental? In my country fundamental frequency which carries power is 50 Hz. But, when I pass this power to CFL(compact fluorescent lamp) and get the FFT of the current passing through it (through MATLAB). 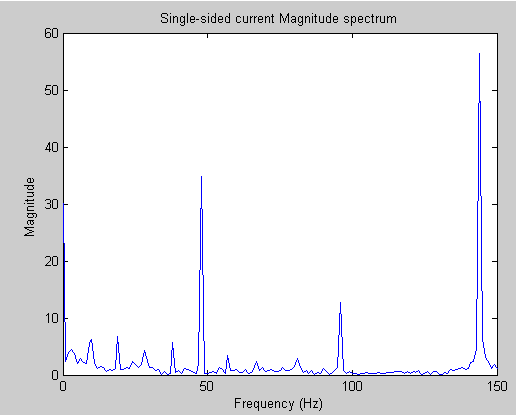 The spectrum shows me fundamental component(50 Hz) magnitude less than the third harmonic(150 Hz) roughly twice of the fundamental. Hope this will clarify my question. The simple explanation is that the Compact Fluorescent Lamp (CFL) acts as Non Linear System and hence generates signals with different frequency than the input. Another thought would be that the sampling channel as a whole has different response to those frequencies and it damps 50 [Hz] / amplify 150 [Hz] (Or both). You take into consideration the whole chain until you get the digital signal. There was a question here recently where the frequency spectrum of ECG signal puzzled the person asking the question because they expected to see a strong frequency component at the heart rate, about 1Hz, but were trying to understand why the QRS component, was dominant from 40 to 100 Hz. This situation has some some similarity to yours. I would guess that your signal has a short high intensity duty cycle with respect to .02 sec power line interval. You might verify this by looking at the spectra and time series of a single power cycle. Not the answer you're looking for? Browse other questions tagged fft electrical-signal or ask your own question. Current harmonics via FFT — do peaks matter?